» Use correct synonyms in your writing. » Use a range of vocabulary. » Do not repeat words and phrases from the exam question unless there is no alternative. » Use less common vocabulary. » Do not use the same word more than once/twice. » Use precise and accurate words in a sentence. It is advisable that you learn synonyms and use them accurately in your writing in order to give the impression that you can use a good range of vocabulary. Introduction + Basic/ General Trends + Details Description + Summary (optional). Each part has a specific format and therefore being equipped with the necessary vocabulary will help you answer the task 1 efficiently and will save a great deal of time. 1. The diagram shows employment rates among adults in four European countries from 1925 to 1985. 2. The given pie charts represent the proportion of male and female employees in 6 broad categories, dividing into manual and non-manual occupations in Australia, between 2010 and 2015. 3. The chart gives information about consumer expenditures on six products in four countries namely Germany, Italy, Britain and France. 4. The supplied bar graph compares the number of male and female graduates in three developing countries while the table data presents the overall literacy rate in these countries. 5. The bar graph and the table data depict the water consumption in different sectors in five regions. 6. The bar graph enumerates the money spent on different research projects while the column graph demonstrates the fund sources over a decade, commencing from 1981. 7. The line graph delineates the proportion of male and female employees in three different sectors in Australia between 2010 and 2015. Note that, some teachers prefer "The line graph demonstrates..." format instead of "The given line graph demonstrates...". However, if you write "The given/ provided/ presented...." it would be correct as well. 1. For a single graph use 's' after the verb, like - gives data on, shows/ presents etc. However, if there are multiple graphs, DO NOT use 's' after the verb. 2. If there are multiple graphs and each one presents a different type of data, you can write which graph presents what type of data and use 'while' to show a connection. For example -'The given bar graph shows the amount spent on fast food items in 2009 in the UK while the pie chart presents a comparison of people's ages who spent more on fast food. 3. Your introduction should be quite impressive as it makes the first impression to the examiner. It either makes or breaks your overall score. 4. For multiple graphs and/ or table(s), you can write what they present in combination instead of saying which each graph depicts. For example, "The two pie charts and the column graph in combination depicts a picture of the crime in Australia from 2005 to 2015 and the percentages of young offenders during this period." Never copy word for word from the question. If you do do, you would be penalised. always paraphrase the introduction in your own words. What + Where + When. Example: The diagram presents information on the percentages of teachers who have expressed their views about the different problems they face when dealing with children in three Australian schools from 2001 to 2005. A good General statement should always have these parts. 1. In general, the employment opportunities increased till 1970 and then declined throughout the next decade. 2. As is observed, the figures for imprisonment in the five mentioned countries show no overall pattern, rather shows the considerable fluctuations from country to country. 3. Generally speaking, citizens in the USA had a far better life standard than that of remaining countries. 4. As can be seen, the highest number of passengers used the London Underground station at 8:00 in the morning and at 6:00 in the evening. 4. Generally speaking, more men were engaged in managerial positions in 1987 than that of women in New York this year. 5. As an overall trend, the number of crimes reported increased fairly rapidly until the mid-seventies, remained constant for five years and finally, dropped to 20 cases a week after 1982. 6. At a first glance, it is clear that more percentages of native university pupils violated regulations and rules than the foreign students did during this period. 7. At the onset, it is clear that drinking in public and drink driving were the most common reasons for US citizens to be arrested in 2014. 8. Overall, the leisure hours enjoyed by males, regardless of their employment status, was much higher than that of women. Introduction (never copy word for word from the question) + Overview/ General trend (what the diagrams indicate at a first glance). + Most striking features of the graph. 1. Write introduction and General trend in the same paragraph. Some students prefer to write the 'General Trend' in a separate paragraph and many teachers suggest the both to be written in a single paragraph. Unless you have a really good reason to write the general trend in the second paragraph, try to write them both in the first paragraph. However, this is just a suggestion, not a requirement. 2. Your 'Introduction (general statement + overall trend/ general trend) should have 75 - 80 words. "A glance at the graphs reveals that 70% male were employed in 2001 while 40 thousand women in this year had jobs." "A glance at the graphs reveals that more men were employed than their female counterpart in 2001 and almost two-third females were jobless in the same year. " 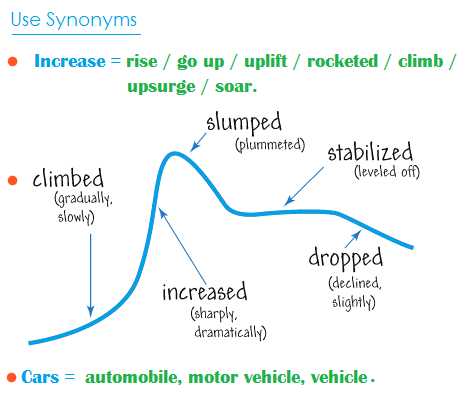 rise / increase / go up / uplift / rocket(ed) / climb / upsurge / soar/ shot up/ improve/ jump/ leap/ move upward/ skyrocket/ soar/ surge. a rise / an increase / an upward trend / a growth / a leap / a jump / an improvement/ a climb. fall / decrease / decline / plummet / plunge / drop / reduce / collapse / deterioriate/ dip / dive / go down / take a nosedive / slum / slide / go into free-fall. a fall / a decrease / a reduction / a downward trends /a downward tendency / a decline/ a drop / a slide / a collapse / a downfall. No change, a flat, a plateau. 1. The overall sale of the company increased by 20% at the end of the year. 2. The expenditure of the office remained constant for the last 6 months but the profit rose by almost 25%. 3. There was a 15% drop in the ratio of student enrollment in this University. 4. The population of the country remained almost the same as it was 2 years ago. 5. The population of these two cities increase significantly in the last two decades and it is expected that it will remain stable during the next 5 years. 1. Use 'improve' / 'an improvement' to describe a situation like economic condition or employment status. To denote numbers use other verbs/nouns like increase. 2. Do not use the same word/ phrase over and over again. In fact, you should not use a noun or verb form to describe a trend/change more than twice; once is better! 3. To achieve a high band score you need to use a variety of vocabulary as well as sentence formations. dramatically / rapidly / sharply / quickly / hurriedly / speedily / swiftly / significantly/ considerably / substantioally / noticably. dramatic / rapid / sharp / quick / hurried / speedy / swift / significant / considerable / substantial / noticable. moderately / gradually / progressively / sequentially. moderate / gradual / progressive / sequential. Slight change slightly / slowly / mildly / tediously. slight / slow / mild / tedious. 1. The economic inflation of the country increased sharply by 20% in 2008. 2. There was a sharp drop in the industrial production in the year 2009. 3. The demand for new houses dramatically increased in 2002. 4. The population of the country dramatically increased in the last decade. 5. The price of the oil moderately increased during the last quarter but as a consequence, the price of daily necessity rapidly went up. 1. The price of the goods fluctuated during the first three months in 2017. 2. The graph shows the oscillations of the price from 1998 to 2002. 3. The passenger number in this station oscillates throughout the day and in early morning and evening, it remains busy. 4. The changes of car production in Japan shows a palpitation for the second quarter of the year. 5. The number of students in debate clubs fluctuated in different months of the year and rapid ups and downs could be observed in the last three months of this year. 1. 4. DO NOT try to present every single data presented in a graph. Rather pick 5-7 most significant and important trends/ changes and show their comparisons and contrasts. 2. The question asks you to write a report and summarise the data presented in graphs(s). This is why you need to show the comparisons, contrasts, show the highest and lowest points and most striking features in your answer, not every piece of data presented in the diagram(s). » From 1990 to 2000, Commencing from 1980, Between 1995 and 2005, After 2012. » By 1995, In 1998, In February, Over the period, During the period, During 2011. » In the first half of the year, For the first quarter, The last quarter of the year, During the first decade. » In the 80s, In the 1980s, During the next 6 months, In the mid-70s, Next 10 years, Previous year, Next year, Between 1980 - 1990. » Within a time span of ten years, within five years. » Next month, Next quarter, Next year, Previous month, Previous year. 10% increase, 25 percent decrease, increased by 15%, dropped by 10 per cent, fall at 50%, reached to 75%, tripled, doubled, one-fourth, three-quarters, half, double fold, treble, 5 times higher, 3 timers lower, declined to about 49%, stood exactly at 43%. 32% Nearly one-third, nearly a third. 79% = Well over three quarters. 72% = A significant majority, A significant proportion.89% = A very large proportion. » A little less than. What criteria would a band 9 graph response satisfy? A) Fully satisfies all the requirements of the task. B) Clearly presents a fully developed response. What will be assessed by the examiner? a) How appropriately, accurately and relevantly you fulfil your task requirements. A) Uses cohesion in such a way that it attracts no attention. a) No misinterpretation and presentation of data and trend. b) How well you organise your paragraphs. c) Overall clarity and fluency of your report and message. d) How well you have organised and liked the information, data and ideas in your writing. e) Logical sequencing and appropriate use of linking devices between and within your sentences. 1. Do not incorporate more than 3-4 paragraphs. 2. Do not use a single paragraph to describe everything. 3. The conclusion part is optional. If you think that you have already written more than 170 words and have nothing to say, you can skip the conclusion. A) Uses a wide range of vocabulary with very natural and sophisticated control of lexical features. B) Rare minor errors occur only as ‘slips’. a) The range of vocabulary you have used in your writing. b) How accurately and appropriately you have used words/ phrases while presenting the graph(s) as a report. Tips: Do NOT use words/ phrases that are already given in the question. Do so only if there is no alternative word(s)/ phrase(s) to convey the same meaning/idea. A) Uses a wide range of structures with full flexibility and accuracy. Do not use the same sentence structure and data comparison/ contrasting style over and over again. Bring a variety in your writing to show that you can formulate different sentence structures without making any grammatical mistakes. If anyone wants to learn to speak online, do contact for information. Thanks for this useful page. Does anyone want to be my speaking partner? I am going to take the IELTS test in the early of next month. Contact me if you want to talk. Nice to meet you! Hi, I will like to be your speaking partner. Actually, my speaking exam is in on 5 of April. Extremely helpful writing task 1 vocabularies. I need to enhance my vocabulary. I am interested, brother. I have an exam on 13th April too. Hey guys, I have my IELTS exam on 13th April 2019. Does anyone want to become my speaking partner? Or can anyone help me with writing section? Hey guys, I have my IELTS exam on 13th April 2019. Does anyone want to become my speaking partner? Or can anyone help me with the writing section? I would like to, can I have your WA number? Yes, I have already completed my IELTS speaking test and I can help you if you want. My WhatsApp number is 03440493827. Yes bro, I want to become your speaking partner. Does anyone want to study abroad and looking for a speaking partner? I am too. My number is +212609753078 for WhatsApp. Yes, I want to become your speaking partner. All I got to know is very helpful for me. However, I couldn't find any comparison vocabularies & synonyms as well which can help me increase my band score. This is something like the lifesaver at the last moment for me. I'm looking for a good vocabulary to get 7 in speaking and writing task 2. Please help me. Thanks. My name is Vikram and I booked my IELTS exam slot on 14th March. I need help with writing and reading, as well as in speaking. Dear mentor, could you please email me the task 1 materials? gmail.com. I am Manik from Bangladesh. Thank you. I'll try to follow you as much as I can. for that. Is there anybody who has booked his exam for 14 February? We will consult together. My number is 9872892188. This really helped me out. Thanks so much. Thank you so much. It is the best of all! Wow, that was helpful. Thanks. Hi everybody, it would make me so happy if anybody can help me to learn more about the IELTS exam because I have no idea. If its possible, anybody please help me. I want to improve my ability. Yes, I am. What kind of help do you need? Thank you so much. It was so helpful. What I was looking for is certainly this! It is an awesome treasure. Hey guys, I haven't booked my test yet as I am not confident to do it at the moment but it will be at the end of February. I'm struggling in reading and writing sections. I'm looking for someone to practise more. My number is 07490095628. Most relevant information for writing task 1. Thanks a lot!! You are most welcome. Thanks a lot for your nice comment. Hi guys, my IELTS test is on 18 January 2019. I need some information regarding reading and writing. My WhatsApp number is +971522609980. Hello everyone, I am going to have my IELTS exam in February. Who wants to speak with me? My number is 009005542435531. Anybody, please help me in IELTS reading. My number is 7837576919. I want to practice with someone. My FB ID is jahir158630. Hi, I am from Bangladesh and I will take part in the IELTS examination. Will you be my partner? My FB ID is jahir158630. When are you going to take the exam? I am attending the exam on 12th January. Hello, I am also taking my exam on 17th January 2019. So if there is someone taking the test in the same date we can consult together. My Viber number is +9779861749693. gmail.com). I am planning to take my exams in January. Good luck to your exams and God Bless you all. Hi, everyone. I would like to invite you to practice for the IELTS exam. It is on 5th December. Hello friends, my exam is coming soon. So I would like to invite you to join me and practice for the exam. Thank you so much. Hi, would it be via WhatsApp? My exam would be on next week, Saturday. Thanks for helpful tips, my exam is on 12th January. Is anyone here to practice with me? My WhatsApp number is 009647504718643.
gmail.com and WhatsApp is +994507561867. Same here! My exam is on 1st December! My exam is in February and I have to improve my vocabulary. Please introduce to me a good source to improve my knowledge. How was your exam on 15th December? Could you give me some tips on reading? Can you help me? gmail.com. We can have conversations through WhatsApp. I have my exam on the same day. gmail.com. It is my genuine request. Reply as fast as possible because wasting time is not good for us. Hello everyone, it's Sujith here from Dubai. First of all, I should thank ielts-mentor.com for providing these tips and tricks to tackle the IELTS examination. Moreover, I think it is a good platform to the IELTS aspirants like me to share views about the exam and also to communicate with themselves and help each other in different sections of this exam like speaking. Can we do it together as my exam is on 17th November too? I need to improve my reading skills for the IELTS exam. Hello, my exam is in next month. I need a partner for speaking practice. Who would like to have a conversation with me? My WhatsApp is +994516145575. My exam is in 3 days. Hello everyone, my exam is on 1st November. I need help in writing as well as in speaking. If anyone wants to help me then here is my WhatsApp number: 00601139999770. Yeah, same here. I am also. It is going to help me a lot. Thanks. Hello everyone, I need help in writing, reading as well as in speaking. My exam on 27 October. Hello everyone. My exam is on 1st November. I need help in writing as well as in speaking. If anyone wants to help me then here is my WhatsApp no. 8195813468. I need help in writing, reading as well as in speaking. My exam on 27 October. My phone number is 8904305921. I am appearing in an actual IELTS test on December 5th. Can you provide me with a guideline? I need a partner who would help me in speaking and improving my vocabulary. Please help me. I need a partner who would help me in speaking and improving my vocabulary. Kindly help me as my exam will be on 20th October. Thank you. Hello Amit, I also need a partner for practising speaking. Will you help me? Hi, I am available. If would like to talk to me, my number is +92345-9898919. My Skype ID is 'kchlodny anytime...! gmail.com. I am also looking for a speaking partner. Thank you. Hello, I have a question. If you are already in Toronto, then why do you need to take the IELTS exam? Hi, my name is Hitarth and I am from India. I also need a Speaking Partner for my IELTS practice. I am planning for Toronto so if you are interested, I would like to practice with you. Hi, can we do speaking practice with each other? I also need a speaking partner. So you can join me. Why can't you do speaking practice with me? Hi, I'm also looking for speaking partners. My WhatsApp number is 9569409008. Hi Antika Das, I am also looking for a speaking partner. My WhatsApp number is 9569409007. If you are willing to do so, which connection way is easier for you? You can talk to me. I'm looking for someone who wants to practice. PLEASE THINK FIRST, DO YOU REALLY WANT TO PRACTICE? OTHERWISE, DON"T KNOCK ME. With the help of each other, we will improve our skills. gmail.com, if you are interested. Thanks. Here is my Skype - "mahi.khan208". If you are interested, you can join me. Send me a request. I would like to speak with you for the breakthrough of my fluency. Would you please accede my invitation? Hello, I have got 8.5 band score in my first attempt. If anybody is interested to get tips, reach me on WhatsApp number 8284986955. I have some queries about writing and speaking tasks. Please help me with both tasks. Please give me some tips for improving my writing as well as reading skills. Hello, I have got an 8.5 band score in my first attempt. If anybody is interested to get tips, reach me on WhatsApp number 8284986955. Does anyone want to join me to practice speaking and other tasks? Please contact on Skype: Kamshat68. I passed the IELTS test with 7.5 in the writing. I've just got the results and so delighted. Bye, I just wanted to share my happiness with you. Hi, can you help me to get a high score in IELTS? How is your overall score? Hi Gabriel, would you be kind enough to share your tips how did you get 7.5 in the writing? Wow! Many congratulations! It's a really high score. Can you give some advice about each task? I'm looking for a partner for IELTS speaking tests. I'm looking for a partner to practice speaking for IELTS exam. I am ready. Why not with me? Hi, I am looking for a speaking partner and want to improve my writing skills. Can anyone help me? Hello, I am Pankaj. I am ready to be your speaking partner if you want. Me too. I want a speaking partner. Yes, I have got great tips for reading and speaking. Hi Rumana, I am also looking for a speaking partner as well. We can practise together if you wish. [quote name="Anusha"]I have an exam on 11th October 2018. I want a speaking partner. If anybody is interested in practising, please message me at 9865609587 on Viber. Hi everyone, I am looking for a speaking partner. Please send a message to me. My Skype ID is 'mahdi.abbasian'. Hi, I am from Vadnagar (Gujarat). I can be your IELTS partner. Hi, I need a partner for speaking practice. Is anyone interested in speaking with me? I will be your partner for speaking. Join me on Facebook - Rishap xetrri. Sure! Please give me a chance to be your speaking partner. I really want to get a partner who would help me increase my communication skill or vocabulary. Hello, I need a partner for my IELTS speaking exam. Is there anyone who would like to speak with me? My number is +995 514 00 04 59. Hi, I would like to assist you. Hi, I need a partner for speaking practice. Is anyone interested for speaking with me? I really need a person who can do conversation with me about improving our speaking skills. I am writing my exam tomorrow, If any of you are writing your exam sooner, wish you good luck. Hello, I'm looking for a partner not just for speaking but for entire IELTS modules. I'm planning to take IELTS in next 30 days. Ping me on WhatsApp 918885657173. I need a partner not just for speaking, but for the entire IELTS test. Please ping me if someone is interested. My WhatsApp number is 918885657173. I want a speaking partner for IELTS to improve my fluency. My WhatsApp number is 03025670717. Hi, I need speaking partners. My IELTS test is on 11th August. Please help me. My WhatsApp number is +918544858140. I am an IELTS teacher. Who needs help? Hi Charlie, I need your help if you could:( I must get at least 7points but it is so hard... Please help me, I will be happy as I have a lot of difficulties. Hi, Joe how much are you going to charge me? Hi, I need your help. I want to improve my speaking skills. Would you please help me? Hello, can I send you my essays to be checked whether they are good or not? Can we retake IELTS even before getting my first test's results? Is it possible to correct my essay writing? Thanks. My Skype account is 'mr850515leo'. I need IELTS speaking partners, hit me up! My email address is 850515leo@gmail. My WhatsApp number is 00201099613769. I am an IELTS student too. Hi, I want speaking partners for IELTS. Hello, I want speaking partners for IELTS. Hi, I want a speaking partner. If anyone is interested, please message me. Thank you in advance! Yes, I also want to do speaking practice. My WhatsApp number is +91 8401010480. Feel free to contact me. Yeah sure, my WhatsApp number is +918544858140. Email me, please. I am interested. Hello, I need a speaking partner too, hit me up. Hallo Leo, please write me your contact number or email address. My WhatsApp number is 8284986955. Well, I also need someone to assess my speaking, we can help each other out. Hey there, I need that too. Hello, I need some help with the speaking module. Send message 'IELTS' on +917383519759. Hello, can I be your partner? Hello sir, My IELTS exam is in next month but I have not properly prepared yet. I need your help, please. I can feel your situation. I'm having the exam in 2 days. gmail.com or +998911115321. Regards - Khuchkharov Dostonbek. The speaking process is most important. It will benefit us to speak from both sides. It's an easy method and easy to learn and write. useful method. It's a much easier method. I love it. Hi, I'm planning to take IELTS next month. Need help in writing module. Hi, same here. My exam will be in next month and I am still unhappy with my scores, especially in speaking and writing modules. I have some problems in writing task 1 and reading. Can anyone help me? Hi, I am preparing for IELTS. Please share your ideas with my WhatsApp number +1 678-918-1665 or phone number +91 908-079-7608. Appreciate your help. Thanks. Hi, I want a speaking partner. Please practice with me, if someone is willing to. My WhatsApp number is +8613155107223. Hey! I'm also preparing for IELTS and I need someone's help. Message me if you wanna learn some foreign words and New Zealand accent.